If you missed #8 click here. Best Moment: Customising your character to great detail and also giving them a fantastic moveset. I also love Season Mode too. Everything that was great in WWF Smackdown 1 was vastly improved in Smackdown 2... apart from the graphics I'd say! The music was much better, the customisation was top notch, all the unlockables were good and very detailed. The Season mode was far more slick and in depth. 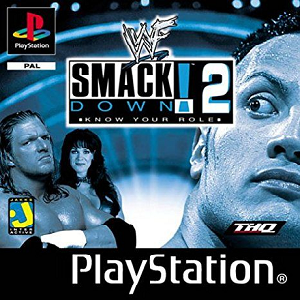 Simply, everything was so much better in Smackdown 2 and I spent many many hours playing through this game, creating my characters, creating multiple characters and trying to also create newer wrestlers who came into the WWF/WWE too. This game came out in the same year as WWF Smackdown 1. You could argue if the games were created this way today, in a modern day video game world that the second one would have been a upgrade patch from the first game, because really they didn't do a lot to the engine of the game, or the graphics. But everything they did was bigger and better. It reminds me a lot of what Valve did with Left 4 Dead 1 and 2, which were released a year after each other. The second games are just brilliant, not that the first games were bad, just that the second ones added more quality and depth. WWF Smackdown 2 was simply one of the best wrestling games ever made, if not THE best wrestling game ever made. I love it. What game came in at #6? Click here to find out!